This entry was posted on Sunday, September 11th, 2011 at 16:14 and is filed under Media, Politics. You might think that on a solemn occasion such as the 10th Anniversary of the September 11th attacks, for once, the left would be able to set aside their campaign of destruction against all things American. Sadly, you’d be wrong in so thinking. Paul Krugman couldn’t restrain himself, and in blustering, irresponsible rhetoric, the reckless and obtuse NY Times columnist is at it again. Not satisfied that Americans will remember the horrors of that day from the perspective of witnesses, and unwilling to accept the clear association between the radical left and our enemies that he helped to foster as an exemplar and prototype, on this 10th anniversary of those horrendous events, Krugman launched yet another attack at those to whom the nation turned on that day for leadership, and who answered the call. On that day, we Americans stood transfixed by the events unfolding in New York, Washington DC, and in a field in Shanksville, PA. As we did so, Mr. Krugman was already formulating his response in the form of further attacks in opportunism at the earth-shattering event. This is just a sample of Mr. Krugman’s perpetual indecency. As you will remember, I’ve recently covered Mr. Krugman’s apparent wish for a war, or an alien invasion, to rescue us from our economic crisis. In typical fashion, Mr. Krugman decries political motives while spending the space of his short diatribe discussing little else. “Right now most Americans are focused on punishing the perpetrators. But Tuesday’s tragedy was partly self-inflicted. Why did we leave ourselves so vulnerable? If you’re astonished that Mr. Krugman could so easily blame America, consider that in his bankrupt world-view, the victim is always to blame. In another perverse inversion of right and wrong, Krugman reveals his real motive: He wanted to use the occasion of the horrors on 9/11 as the pretext to raise taxes on the American people. More, he regarded 9/11 much as Reverend Wright, apparently, though in a different context: The event was merely the return of our chickens to roost. What sort of monster is it who lurks within a short distance of this spectacle of death and destruction, and first thinks to politicize the event and to urge more burdens on a shocked nation? Paul Krugman is that sort of monster. In pointing to a Wall Street Journal editorial of September 19th, Krugman ignores his own editorials published on the 14th, 16th, as well as the 19th in which he sought to use the events of 9/11 to drive home his political and economic agenda. There’s nothing quite like the pot calling the kettle “black,” and few have been so willing to do so as Paul Krugman. Mr. Krugman is entitled to his opinions, but not his own custom-manufactured version of history. Remembering that he is among those who first sought to use 9/11 to political advantage is important, for while he claims in shrill terms today to eschew any form of cashing-in on 9/11, the truth is that he was among the first in print, anywhere, who sought to do precisely that, if only in support of his own preposterous economic policy ideas. 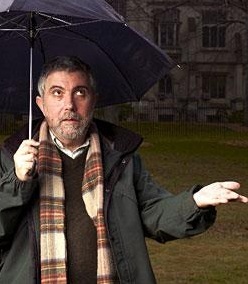 We’re all well aware of Paul Krugman’s status as a Nobel Laureate, but by now we should have realized that rather than in economics, his prize ought to have been in partisan vitriol. Ten years after the day of such horrors, when most Americans are quietly contemplating all that has been lost, Krugman could not deny to himself the opportunity to take one more shot at President Bush. He may not want any response published on his own page, but as more Americans realize just who Krugman really is, I scarcely believe he will avoid it. Suffice it to say, if you think he had sunk to sickening depths in the past, today's column is a dive into the pit of hell. I don't know why anyone would send one nickel to the NYT and help support this pitiful, cowardly, shell of a man. I pray that paper never receives another red cent from anyone. Rush doesn't call him "Paul al Krugman" for nothing….he's a secular apostate Jew who is in favor of sharia-minded terrorists sending an Airbus into the Times' windows….the leftist NYT continues its descent into obscurity and irrelevance.